Eclectic designs printed on gifts & apparel just for you – a cut above the rest! 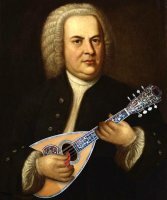 A famous portrait of the esteemed composer Johann Sebastian Bach is cleverly “doctored” to show him playing a mandolin. The result makes a wonderful gift design for anyone who has experienced the magical bliss of either playing or listening to Bach’s music performed on any of the mandolin family instruments! Purchase the unique “Bach on Mandolin” design now on a t-shirt, hoodie, mug, or various other apparel and giftware items for your favorite mandolinist, mandolist or mandocellist – even for yourself, perhaps – exclusively from GearGems! And we have a Bach portrait design, as well as one of Bach’s famous quotations. The best & brightest Viola and Violist gear on the Web since 2004! Pithy and profound quotations about music and music makers! Bach, Beethoven, Brahms and more; wear and display your music geekiness! New - Custom handcrafted knotwork drinking gear! Cat lovers are special people - and we have some great gift ideas for them! Sparkling, colorful violin bottle images! Got gemstones? Gem & Mineral Society? Wanna show 'em off? for the Rockhound in everyone! Get the gear that lets you speak your mind! WE'RE HAPPY TO CUSTOMIZE and/or PERSONALIZE our DESIGNS for you, and will CREATE UNIQUE, SPECIAL CUSTOM ORDERS, too! Celebrate our furry feline friends! One-of-a-Kind Viola, Violist and Alto Clef designs! Our Emporium of musician, musical instrument and music lover designs! Designs copyright © GearGems.com 2004-2018. All rights reserved.